Unicellular parasites belonging to the genus Trypanosoma cause sleeping sickness in humans. Sleeping sickness is a debilitating and potentially lethal disease in Sub-Saharan Africa, which is transmitted by the tsetse fly. Professor Nicolai Siegel, who heads a research group in molecular parasitology at LMU (Chair for Experimental Parasitology), uses trypanosomes as an experimental model system to study the incessant ‘arms race’ between parasites and their hosts: As the host immune system evolves ways of fighting parasitic infections, parasites continually develop strategies to outwit these mechanisms. 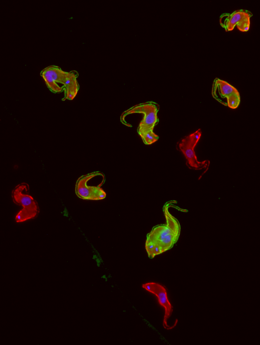 Trypanosomes are specialists in the art of immune evasion. In a process known as antigenic variation, they constantly alter the structures of their surface coats, forcing the host’s immune system to redirect its fire against a novel target. Siegel’s group, in cooperation with colleagues based at the universities of Würzburg, ZB MED - Information Center for Life Sciences, TH Köln, the Helmholtz Institute for RNA-based Infection Research (HIRI) in Würzburg (an institute of the Helmholtz Zentrum for Infection Research) and institutions in the US, UK and Israel, have now taken a closer look at the genetic mechanisms that underlie the parasite’s ability to alter the proteins displayed on its surface. The researchers demonstrate that DNA packaging proteins which are involved in regulating access to specific segments of the parasite’s genome play a central role in the process. The new findings appear in the leading science journal Nature.